A French group opposed to Apple's tax maneuvering in Europe took to the company's stores this weekend in a public protest. Attac France travelled to Apple Stores in Paris and Aix-en-Provence Saturday to hold a "die-in" protest against the Cupertino iPad seller and its cunning schemes to divert taxes away from the French government and into tax havens. The anti-globalization group says the protest is over Apple's refusal to pay its fair share of local taxes in France. 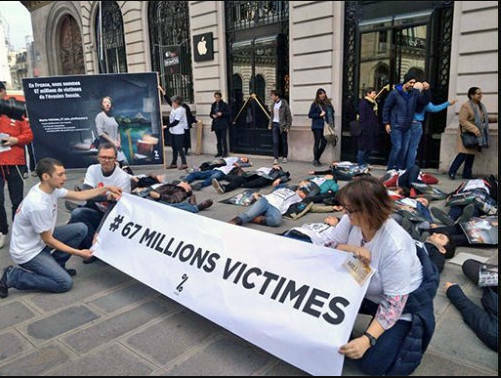 To get their point across, Attac members laid down in and around the stores to symbolize what they say are the 67 million French citizens who get shafted by Apple not paying taxes in the country. The group wants the French government to collect what it believes to be anywhere from €60bn-€80bn in taxes Apple and other large companies evade paying every year. Just a refresher: last year, Apple was found by the EU Court of Justice to have stiffed the Union to the tune of €13bn by taking advantage of Ireland's friendly corporate tax laws - since deemed illegal. This is not the first time Attac has taken its ire out on Apple's French retail fronts. Last December, the same Paris store was the scene of a similar protest where Attac members occupied the store for several hours to voice their grievances with Cook and Co's accounting practices. As Apple's ugly licensing battle with Qualcomm over royalty payments is showing no signs of letting up, it now looks like CEO Tim Cook will have to face questions.